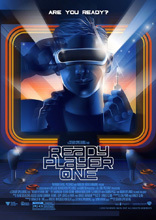 Aroview: Director Spielberg plays to his strengths in this adrenaline-filled love letter to 80's pop culture and video games. Set in the year 2045, most of humanity finds escape from their devastated planet through a virtual reality game called OASIS. An orphaned teenager discovers a hidden challenge within the game which promises the winner full ownership of the game itself.